Anyone who's held a job knows what it's like to have that one nightmare coworker. Maybe it's a deskmate who blatantly steals lunches from the fridge, or a loudmouth gossip who's always kissing up to the boss. Still, it's tough to imagine you'd ever be as mad at everyone in your office as one disgruntled employee in Michigan, who brought in a bunch of laxative-laced brownies for a coworker's going-away party. During what should have been a bittersweet going-away party for a departing employee at MMI Engineered Solutions in Saline, Michigan, things got testy when someone tipped off management that another coworker with a grudge against the person leaving was planning to serve a batch of poop-inducing brownies. The cops eventually showed up and it turned into quite the ordeal, according to a report from Michigan Live. 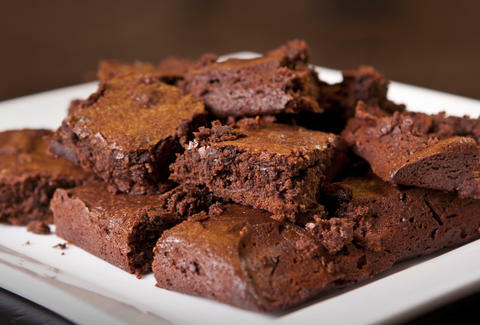 On May 3, police were called to the offices of MMI after the company got a tip about a certain employee who'd warned she was going to bring in some dosed brownies for the sendoff. This woman and the departing coworker evidently had some bad blood, and she was hoping to totally spoil the going away for everyone who attended. Details on the origin of the ongoing spat aren't clear, but according to Michigan Live, employees interviewed by the police said that "there may have been some previous tension" between them. Which, duh. Fortunately for the sweet-toothed employees, the dastardly plot was foiled at the last minute. When the cops showed up, they confronted the employee and asked point blank whether she'd put laxatives in the brownies. She denied it, but when they threatened to forensically test of them, she caved. In the end, the cops didn't arrest her, but she was fired on the spot. No word yet on what the departing coworker thinks of the whole incident, but safe to say they're probably pumped they don't work there anymore.